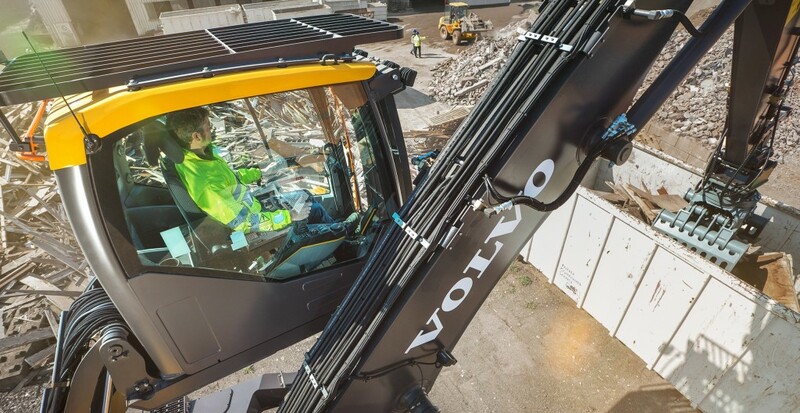 The Volvo EW240E's Hydraulically elevated cab raises 16 feet, and has double-damped cushioning to reduce noise and vibrations, as well as L8 multifunction joystick with Comfort Drive Control (CDC) and a Standard arm-in-limiter prevents grapples and material from contacting the cab. "The EW240E was developed specifically for the waste and recycling segment," says McLean. "People are excited to see the machine and try it out. With a newly designed centre frame mounted on a reinforced undercarriage with 9-foot axles and extra-wide outriggers, the new material handler is ideal for medium-duty applications such as handling waste material blocks and loading and unloading scrap." Not only is the EW240E Material Handler designed with a larger, wider and heavier undercarriage, but it also has a reinforced upper frame featuring modified positions for the boom and boom cylinders, all tailor-made for material handling applications. McLean emphasizes that the EW240E Material Handler differs from previous Volvo models with application in the waste and recycling industry, including the proven EW210D material handler, by being purpose-built for operation in waste and recycling. He says Volvo listened to years of customer feedback and designed this model specifically based on what customers indicated the industry needed. With a newly designed centre frame mounted on a reinforced undercarriage with 9-foot axles and extra-wide outriggers, the new material handler is ideal for medium-duty applications such as handling waste material blocks and loading and unloading scrap. - ActiveCare Direct telematics is available. The EW240E was developed specifically for the waste and recycling segment. "When designing this model, we focused on finding new ways to benefit the operator and increase operator safety," McLean says. "One of those additions is our Comfort Drive Control, which lets the operator steer the machine and control the outriggers by using joysticks rather than separate levers. Also, because material handlers never leave the working yard, there is an option to order the machine without a steering wheel. Without a steering wheel, the operator can get a much better view of his working area." McLean notes that while the EW240E Material Handler is Volvo's first dedicated material handler for the North American waste and recycling sector, Volvo Construction Equipment has been in the industry worldwide and in North America for many years. "Our wheel loaders, excavators, haul trucks and attachments are frequently used for this type of work and represent our commitment to the industry," he says. "Another example of our dedication to serving customers in waste and recycling was the introduction of the LC450H landfill compactor in April 2018. This was Volvo's first purpose-built landfill compactor in North America." Volvo's EW240E Material Handler will be on display at ISRI 2019 in Los Angeles, California, April 2019. This article was originally published in the November/December 2018 edition of Recycling Product News, Volume 26, Number 8.